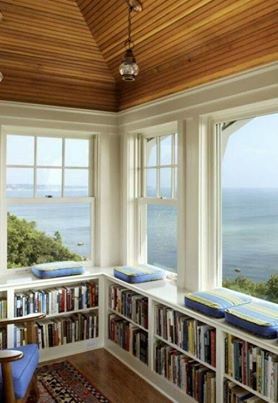 A book lover by nature wants a house with a view and especially a view of water. Here we have a nice corner nook with a wooden floor (book lovers don’t go in for plush shag carpeting) with a tasteful rug, and a comfortable chair with armrests. And of course you notice two shelf bookcases filled with books. In the middle of the picture between those two cushions is an area for cheese and crackers and a glass of wine. Or, if you are like me, a dozen maple bars. This area is one in which you read the classics. It is perfect for Homer’s Odyssey, The Last Days of Socrates by Plato, Paradise Lost, but nothing of Thoreau. You take Thoreau when you go camping. Having immersed yourself in the classics during the week, you can read cozy mysteries here on weekends. To the right you is a picture you see a wonderful library guarded by your dog-he comes with the house-and you notice his front legs are ready to spring into action as a true guard dog would do in protecting your library. On the other hand he could be thinking you are bringing him a treat. And look at the most comfy chair to snuggle up with a book and the small side table for more wine-Riesling, for this room, red for the corner nook above. A must have spiral staircase and a ladder for checking out all the great references books like The Oxford History of the Classical World, or The Complete Sherlock Holmes, or perhaps John Fowles, but not Harold Robbins or Jackie Collins. And I am sure you notice the window facing the armchair. If you don’t like the view you can place a High-definition TV there in order to watch Masterpiece Theatre, then read Thackeray, Dickens, Thomas Hardy, and Kurt Vonnegut. 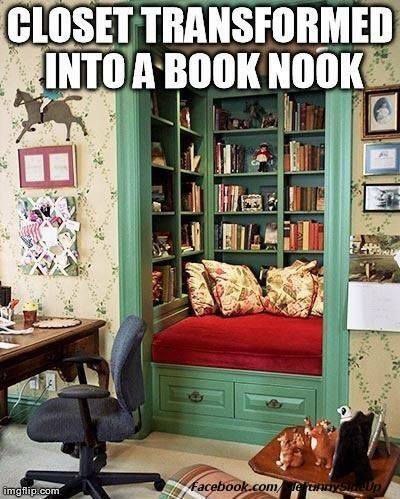 And here we have a wonderful Nook. This can be your office. I think the room is too feminine and the horse and rider must go along with the wallpaper. This room is a fixer-upper. 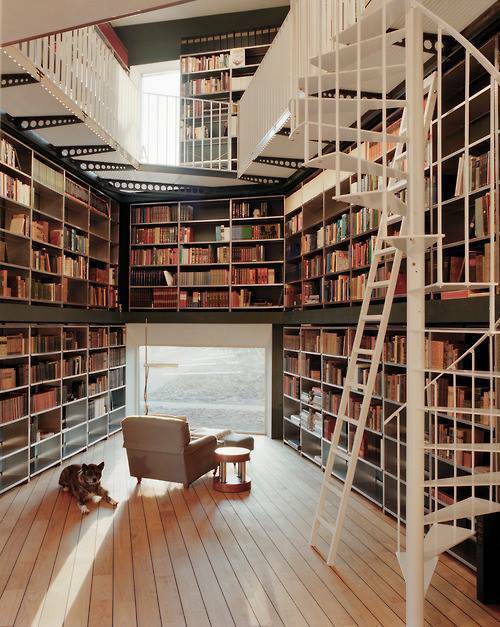 But it has great potential with perhaps the most comfortable place to read in the house. 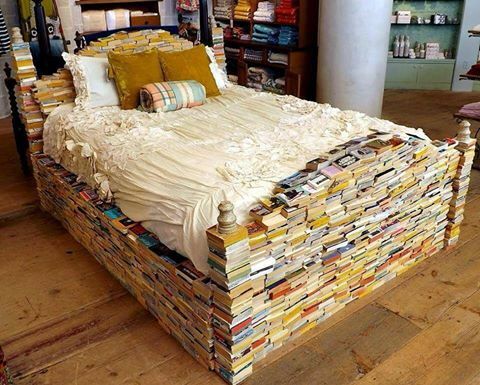 It is also a place where you are more liable to fall asleep so you want more light reading here. Or books you don’t want any visitors to know that you read. You know who I mean, Harold Robbins-but Tom Robbins is perfect; not Jackie Collins, but Willkie Collins is okay. It is also a cozy place to settle in with your significant other and read erotica together. If no ‘other’ is available, this is a good spot for your cat to settle onto your lap and purr as you read the play script of Cats. And you can serenade your pet with songs from the play. I suggest doing that last bit when no company is in the house, otherwise you are likely to end up in therapy. Here we have a unique chair. 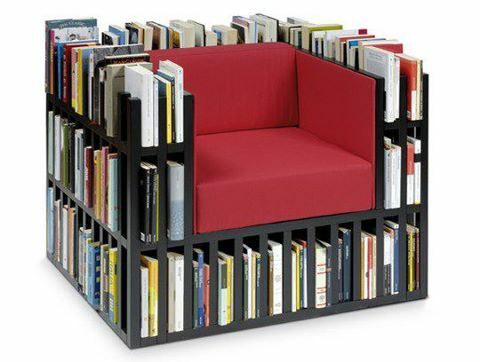 The cushion looks comfy, but your elbows may have to rest on the tops of books as they are taller than the chairs side. I recommend paperbacks on the top so that problem is eliminated. The type of books are cop thrillers, suspense, horror-Dean Koontz and Stephen King-and fast summer types of reads. Go confidently in the direction of your dreams. Live the life you imagined.-Henry David Thoreau. That’s easy for Thoreau to say. Writers are good at two things. One is observation, looking into the abyss as Thomas Mann once said, and writing of the human condition based on those observations. The other is giving advice, based on the writers observations coupled with experience. Readers based on their observations and experience can agree or disagree. The quote by Thoreau above, though well-meaning, I am sure, does a century and a half later, sound like pop psychology, something Thoreau would have no knowledge of tucked away in Walden Pond. But much of pop psychology is built around follow your dreams. Go confidently in the direction of your dreams. We all have dreams, some pursue them relentlessly, some fruitlessly, others, however, prefer the dream to reality, for many personal and psychological reasons. The dream is always easy, the chase always hard. But Thoreau does not promise success. He merely says to go in the direction, to follow your dreams down the yellow brick road. Pursuing a writing career is like pursuing an acting career. One always hears about movie stars and the money they make. But the Screen Actors Guild will tell you the truth, that being that the vast majority of actors make a yearly income below the poverty level. The same is true of writers. For every Stephen King, there are one million struggling writers, none of whom can achieve his success. Most writers are poor, have real jobs, only going confidently in their spare time. But all struggling actors and writers either continue to pursue their dream, or decide to get off the yellow brick road, returning to a Kansas reality. Live the life you imagined. Sounds again like pop psychology and something I have often heard before under the guise of ‘if you act the part, soon you will be the part.’ If you act like a writer for instance, in other words, writing every day, whether you want to or not, accepting rejection everyday, whether you like it or not, then by positive thinking and believing you will become what you imagine. Live the life you imagined worked for director Steven Spielberg and it also worked for Ed Wood (Plan 9 From Outer Space). They both achieved fame. Wood’s came from making the best ‘worst movie of all time,’ but I admire Wood more because he truly lived the life, and did so doggedly, in the Thoreau way. Better for writers not to dream of Stephen King type success, just write as you imagine and hope you don’t write the best ‘worst book of all time,’ unless of course that is the life you imagined.